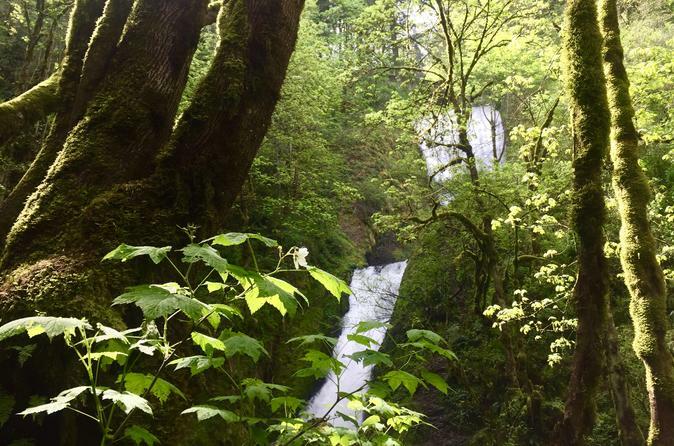 Hike to waterfalls, bike the beautiful curves of the Historic Columbia River Highway, and see the Columbia Gorge beyond the experience of most tourists. The gorge is so rich, with waterfalls spouting off 800-foot-tall towering basalt walls in view of the freeway; but our tour is off the interstate. We start at our favorite viewpoint in the gorge, seeing the river and two states' worth of beauty laid out before us; then we get on our bikes and ride down twisting, quiet historic highways to our favorite waterfalls. We'll lock up our bikes and hike the 2.5-mile loop to a waterfall a gentle climb up the side of Larch Mountain. After the loop, a short bike ride takes us to two more tucked-away waterfalls, before we get back on the interstate to see still more. Tour includes snacks, and coffee or tea, as well as fitted bike and helmet. One of our enthusiastic guides will ride and hike along with you (if parking is available); ours are the only fully-supported gorge bike tours available! You'll meet us at our inner SE Portland location at the corner of SE Main Street and 9th Avenue, near the roasteries for Coava Coffee and Stumptown. Once you arrive, have some local tea or coffee (a pourover prepared by your tour guide, perhaps) while we fit you for a bike and helmet. Your guide will load your bikes in a comfortable Sprinter van or SUV and head out toward the western edge of the Columbia Gorge. You and your group will take a scenic stop to introduce you to the geology and microclimates through which you'll shortly be riding. While your guide unloads your bikes, grab photos of the vistas before you don your helmet; then ride down the thrilling, magical curves of the Historic Columbia River Highway. You and your guide will ride three to four miles, stopping at the beautiful Vista House, before parking your bikes at the trailhead for the Latourell Falls loop hike. Your guide will secure your bikes as you head towards this stunning waterfall, a 2.5-mile loop up above the top of the more often-visited lower Latourell Falls toward the beautiful upper falls, an abundant waterfall that plunges over a columnar basalt cavern among a mass of wildflowers and wild berry plants. The cavern is close enough to the path that you can wander into it, feeling the dripping of the water from over your head, feeling the ancient walls beside and above you. Take your time, exploring the huge Western redcedars and enormous old Douglas-firs, smelling the fringe cups in the spring, tasting the berries in the late summer. At the end of your hike, you'll continue on your bikes to Bridal Veil Falls, where you can wander a third of a mile down the western edge of the waterfall and approach this tiered beauty from below. Your guide will put the bikes back on the vehicle and you'll get back in for one last waterfall experience. You and your group will drive the short distance to Multnomah Falls, the stunning 620-foot highest falls in Oregon, where you will have an opportunity to stop briefly for photographs from the base of the falls before driving back to Portland. Your professional guide will provide historical commentary and conversation throughout the day, as well as telling you stories about native legends and giving you the opportunity to renew yourself with what one of our favorite zen bicyclists calls "mindful riding" and the nature bathing that hikes involve. You'll be returned to the central Eastside, or your hotel or AirBNB (or somewhere for a huge lunch! ), at the end of the journey.